Choose a page number to see the recommended websites and downloadable pictures. On each page, the first link goes to the website that can also be reached by scanning the QR code printed in the latest edition of this book. For puzzles and quizzes, click on the links below. 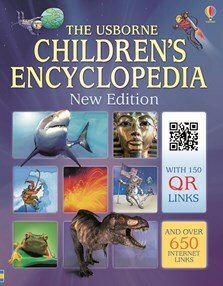 Please note, these links are relevant for all editions of the Usborne Children’s Encyclopedia, with or without QR codes. An inspiring reference book for young readers to pore over, covering a wide range of topics from art and animals to new technology. Arranged thematically and illustrated with over 1500 colourful photos, illustrations and diagrams. QR codes provide instant access via a mobile phone or tablet to 150 video clips of animals, space, places round the world and more, which enhance the information in the book. An additional 650 internet links via the Usborne Quicklinks website take children to websites with online activities, games and further information. My 3-7 yr olds love to have this read to them and sit to look at the big colorful pictures. My 9 yr old enjoys reading it to herself. I appreciate the variety of topics that are organized into categories, and that the QR codes are so easy to use. My five year old loves this book! He got it for Christmas and we've read a few pages every night. It keeps him interested and asking questions. He really comprehends what we read about and it's a fun book to read. Well laid out, visually captivating and includes some key facts that are useful and interesting for young inquiring minds. This made a generous bedtime story that was difficult to put down! Introduces subjects that could initially be overwhelming to children in easily digestible two page chapters. Thanks Usborne for being one of the few publishers that still makes quality entertaining and informative books that do not dumb down or trivialise imagination for the younger generation!